After a second Anthony Martial goal put Manchester United up 2-1 against Chelsea in the 73rd minute, it looked like José Mourinho had inspired his side, yet again, to put in a second-half comeback performance to seal a win. Three point would have given Mourinho his first victory at Stamford Bridge since becoming United’s manager—he’s lost the previous three matches by a combined score of 6-0. That all came crashing to a halt in the 96th minute when Ross Barkley cleaned up a rebounded header past David De Gea for the late equalizer. The Chelsea bench was rightfully excited but one of the team’s staff members apparently went too far for Mourinho’s liking. 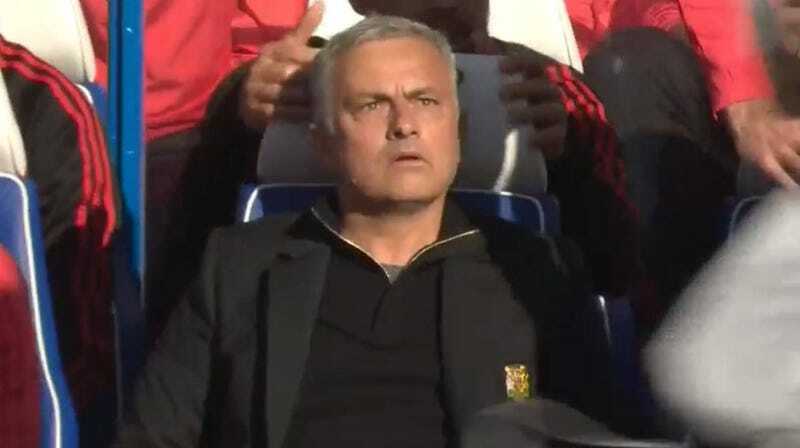 A closer look revealed that one of Maurizio Sarri’s assistants had run over to United’s bench and gave an emphatic fist-pump directly in front of Mourinho, causing the Portugese international to charge at the Chelsea side in anger. But the animosity between the benches would end at the initial scuffle, and the two managers hashed things out after the final whistle. It’s not like Mourinho is a stranger to over-celebrating himself, especially in front of the bench of an opposing team, which is what makes his pearl-clutching over this “impolite” incident so hilarious. Of course, with José being José, he did his best to try and get in the last word to the fans at Stamford Bridge.